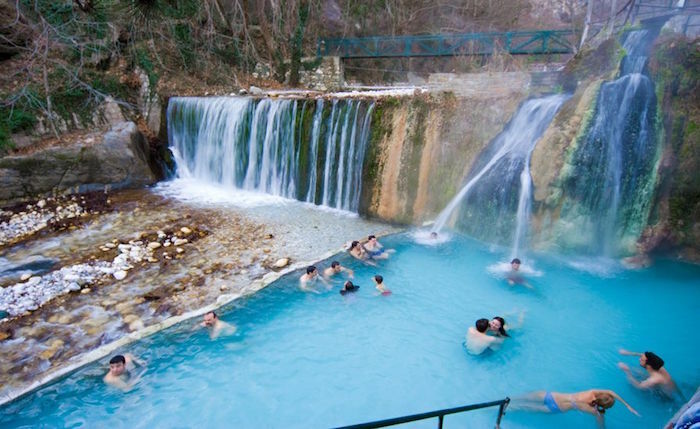 Loutra Pozar is a world-famous thermal spa which receives more than one million visitors every year, the mayor of Almopia, northern Greece, Dimitris Binos, said in an interview with the Athens Macedonian News Agency’s radio station Praktoreio 104.9 FM. Vogue magazine in a recent article recommended Pozar as an alternative Greek destination. “A far cry from the traffic of Athens and the high season island tourism, Northern Greece is noteworthy year-round for its diverse landscapes, ancient history, and innumerable activities both hedonistic and adventurous. The continuous flux of immigrants from Eastern Europe and the Middle East into the towns and villages has resulted in a melting pot of culture and cuisines, while nature provides its own spectacle from East to West,” Vogue said and suggested three destinations, including Loutra Pozar.